Fires in California raged over the summer while in Indonesia, fires threaten the archipelago's citizens along with national wildlife that live in the area. Californian wildfires dominated the news for most of the summer. While the drought pushed the state in the US to some extreme temperatures and environmental hazards that led to the tragic wildfires, at least the state didn’t have to worry about plantation companies intentionally starting a fire that spread rapidly. According to Discovery, the wildfires in Indonesia threaten wildlife and the people living across the area. Worse yet, authorities investigating the cause of the fire say that plantation companies are to blame. The fires spread so quickly and are so dangerous to the locales that the government of Indonesia declared a state of emergency in certain parts of the country. Fires set on the islands of Sumatra and Kalimatan created a haze so dense that inhabitants of the province West Sumatra are dealing with particulate matter that measure 436 micrograms per cubic meter. South Sumatra has reports of over 22,000 people developing respiratory illnesses. 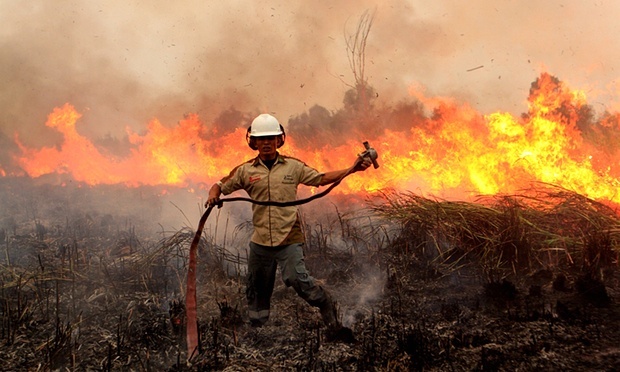 With the dry season taking effect in Indonesia, an archipelago with the fourth biggest population on the planet, fires are a normal part of the life in this country. However, with an unusually powerful El Nino in the area this year, which creates weather distortions across the globe, has had the effect in Indonesia of drying out the trees in the region. This creates the horrible effect of making the forests susceptible of easily spreading any fires. While the inhabitants are also dealing with the effects of these wildfires, the haze and fires themselves also threaten the national parks that are in the area. This affects some of the last remaining habitats for orangutans, Sumatran elephants and clouded leopards. Suspects in this case of negligence on behalf of a company for starting this fire include a senior executive from Bumi Mekar Hijau, a unit of Singapore-based Asia Pulp and Paper (APP). If found guilty of setting these illegal fires, the suspects could face up to 15 years in prison as well as heavy fines. There are speculated to be around 20 companies involved with these fires.